More than 40 Palestinians have been killed and 1,800 wounded by Israeli troops in clashes on the Gaza border, Palestinian officials say. The clashes took place as the US opened its embassy in Jerusalem, a controversial move that has infuriated Palestinians. Palestinians see the move as a clear US backing for Israeli rule over the whole city, whose eastern part they lay claim to. President Donald Trump sent a video message to the opening ceremony, saying Jerusalem move had been a “long time coming”. He assured the US remained “committed to facilitating a lasting peace agreement”. 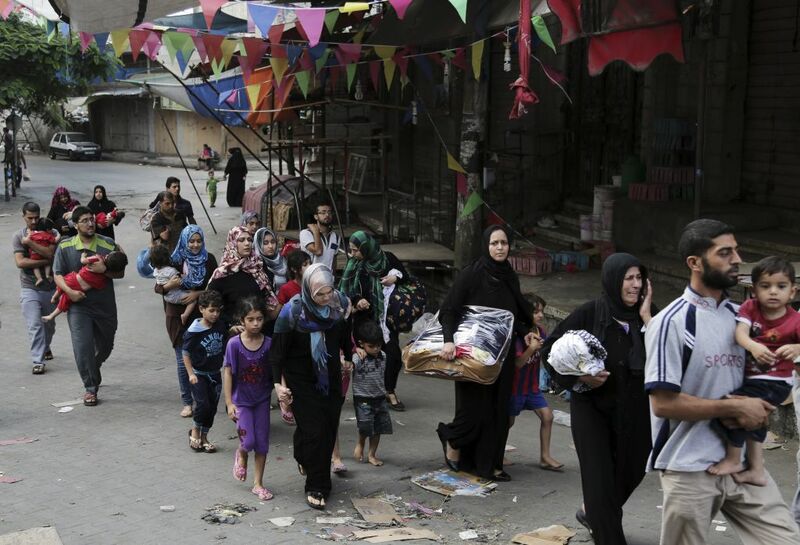 The Hamas-run health ministry said children were among those killed on May 14. The mass demonstrations, led by Gaza’s Islamist rulers, Hamas, are part of a six-week protest dubbed the “Great March of Return”. Israel’s army said 35,000 Palestinians were taking part in “violent riots” along the security fence and that its troops were operating “in accordance with standard procedures”. It said it had killed three people trying to plant explosives near the security fence in Rafah. At least sixteen Palestinians have been injured in clashes in the occupied West Bank, during protests against President Donald Trump’s recognition of Jerusalem as Israel’s capital. According to local reports, the injuries are mostly from tear gas and rubber bullets, but at least one was hurt by live fire. Israel has deployed hundreds of extra troops in the West Bank. Donald Trump’s announcement – met with worldwide dismay – reversed decades of US policy on the sensitive issue. Palestinians in the both the West Bank and the Gaza Strip have gone on strike and taken to the streets in protest. Many of the United States’ closest allies have said they disagree with the move, and both the UN Security Council and the Arab League will meet in the coming days to decide their response. There are fears the announcement could lead to a renewed outbreak of violence. The Palestinian Islamist group Hamas has already called for a new intifada, or uprising. On December 6, President Trump said that he had “determined it is time to officially recognize Jerusalem as the capital of Israel”. The president said he was directing the state department to begin preparations to move the US embassy from Tel Aviv to Jerusalem. Despite warnings of regional unrest over any such move, the decision fulfills a campaign promise and appeals to Donald Trump’s right-wing base. Recognizing Jerusalem as Israel’s capital was “nothing more or less than a recognition of reality”, he added. President Trump said the US would support a two-state solution – shorthand for a final settlement that would see the creation of an independent Palestinian state within pre-1967 ceasefire lines in the West Bank, Gaza Strip and East Jerusalem, living peacefully alongside Israel – “if agreed to by both sides”. He also refrained from using Israel’s description of Jerusalem as its “eternal and undivided capital”. The Palestinians want East Jerusalem to be the capital of any future Palestinian state. Israeli PM Benjamin Netanyahu said Israel was profoundly grateful to President Trump, who had “bound himself forever with the history of the capital”. 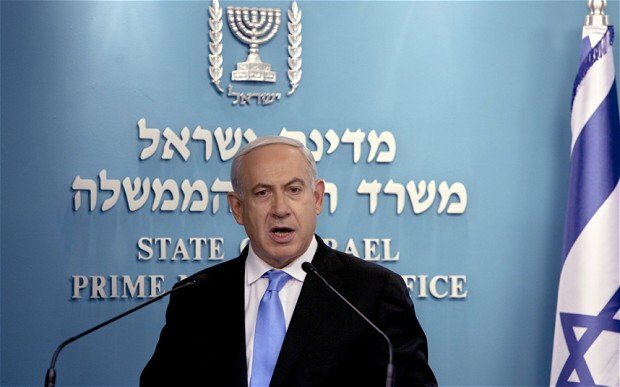 The prime minister also said Israel was “in touch with other countries to follow suit. I have no doubt other embassies will move to Jerusalem – the time has come”. He did not name any of these countries, although the Philippines and the Czech Republic have been mentioned in Israeli media. The mood has been very different on the Palestinian side. Hamas leader Ismail Haniyeh has called for a “day of rage” on December 8 and said it should “be the first day of the intifada against the occupier”. Four Israeli soldiers have been killed and17 others were wounded, in a truck attack in Jerusalem, police said. A Palestinian man drove the truck into a group of soldiers, in what police called a terror attack. The victims are three women and one man, all in their twenties. PM Benjamin Netanyahu said the attacker, who was shot dead by soldiers, was a suspected supporter of ISIS. However, the prime minister gave no evidence to support the claim. The victims were taking part in an educational trip, the Israeli military said. The Israel Defense Forces (IDF) tweeted that their names were Lt. Yael Yekutiel, 20; Lt. Shir Hajaj, 22; 2nd Lt. Erez Orbach, 20 and 2nd Lt. Shira Tzur, 20. 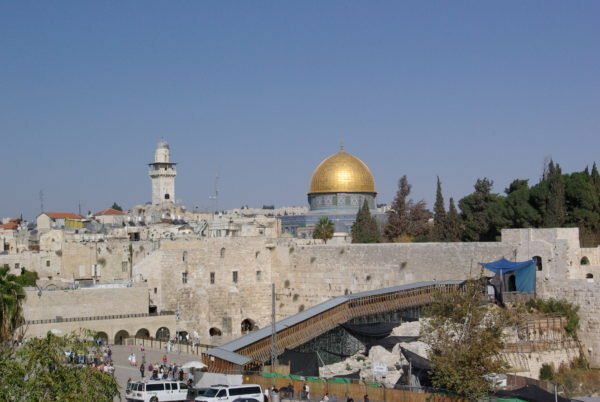 The attacker, identified as 28-year-old Fadi Qunbar, came from the Palestinian district of Jabel Mukaber in east Jerusalem, near to the attack site. The attack took place on the popular Armon Hanatziv promenade overlooking the walled Old City of Jerusalem. In response, police spokesman Micky Rosenfeld said security had been heightened throughout Jerusalem. An emergency meeting of the Israeli security cabinet approved administrative detention for ISIS sympathizers and authorized the destruction of the driver’s home. PM Benjamin Netanyahu visited the site of the attack on January 8 and said: “We know that there has been a series of terror attacks. The latest truck attacks took place during last year in Nice and Berlin. The US state department condemned the attack “in the strongest possible terms” and the EU also issued a condemnation. The Palestinian militant group Hamas praised the attacker. Hamas spokesman Abdul-Latif Qanou called it a “heroic” act and encouraged other Palestinians to “escalate the resistance”. Three senior Hamas military commanders have been killed by an Israeli airstrike on a house in Gaza, militants say. Mohammed Abu Shamala, Mohammed Barhoum and Raed al-Attar died in the attack near the southern town of Rafah. They were among at least six killed, a day after Hamas’s military chief Mohammed Deif reportedly survived a strike that killed his wife and child. An Israeli was severely injured as rockets were fired into Israel on Thursday, the army said. Hostilities resumed after peace talks collapsed on Tuesday. Israel has vowed to pursue its campaign until “full security” is achieved. 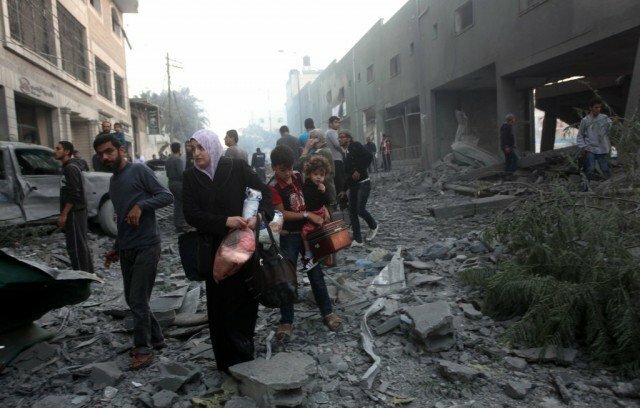 Six weeks of fierce fighting have left at least 2,103 people dead, all but 67 of them Palestinians and most of them said to be civilians. 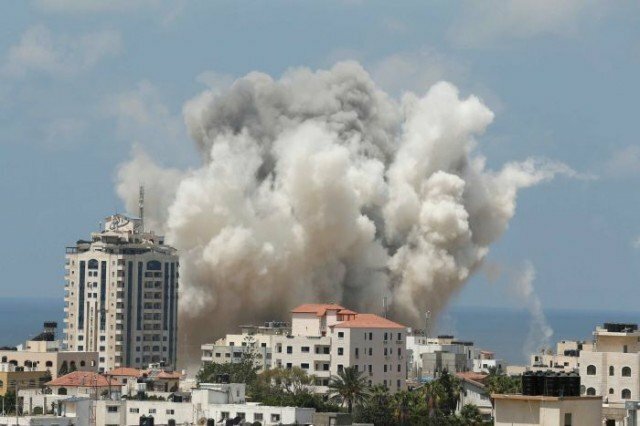 Israel’s strike on Rafah demolished a four-storey building and “dozens” of people were missing, Palestinian health official Ashraf Al-Kidra was quoted as saying by AP news agency. The three commanders killed were key to operations including smuggling, tunnel construction and capturing the Israeli soldier Gilad Shalit in 2006. Israel’s military said it had carried out 20 attacks on targets in Gaza during the night in response to militant rocket attacks. Since talks on extending the ceasefire failed, 213 rockets have been fired at Israel, it added. According to an unconfirmed report by AFP news agency, at least six other Palestinians, four of them children, were killed in Israeli attacks overnight in the northern town of Beit Lahiya and in Gaza City. In another development, Hamas warned foreign airline companies to stop flying to and from Tel Aviv’s Ben Gurion Airport from Thursday. Ofer Lefler, spokesman for the Israel Airports Authority (IAA), told AFP that flights had been disrupted for 10 minutes but there had been “no change to take-offs or landings”. Hamas also confirmed it was abandoning efforts to negotiate a durable ceasefire with Israel. It had gone to the talks in Cairo demanding an end to the Israeli and Egyptian blockades of Gaza, and the establishment of a seaport and airport. The UN Security Council voiced “grave concern” at the resumption of hostilities and “called upon the parties to resume negotiations to urgently reach a sustainable and lasting ceasefire”. Egypt expressed “profound regret” at the end of a 10-day period of “calm” during the talks, and said it would continue to try to secure a lasting truce. An upsurge in violence has been seen in Gaza and southern Israel despite a plea by UN Secretary General Ban Ki-moon for a cessation of hostilities. Explosions in Gaza City reportedly killed 10 people, including children. Israel confirmed five of its soldiers died on Monday – one inside Gaza and four in a mortar attack along the border. Five Hamas militants were also killed inside Israel, officials said. Israeli PM Benjamin Netanyahu warned of a “prolonged” Israeli campaign in Gaza. “We will continue to act aggressively and responsibly until the mission is completed to protect our citizens, soldiers and children,” Benjamin Netanyahu said. Calling Monday a “painful day”, Benjamin Netanyahu said Israel would not finish its operation until it had “neutralized” Hamas tunnels out of Gaza. Fighting between Israel and Hamas has claimed more than 1,030 Palestinian lives, most of them civilian, since 8 July, when Israel launched an offensive against Hamas in Gaza after a surge in rocket fire. On July 18, it extended operations with a ground offensive, saying it was necessary to destroy tunnels dug by militants to infiltrate Israel. Israel’s military death toll rose to 48 with Monday’s deaths. Three civilians have also died. Earlier, Ban Ki-moon urged an immediate halt to the violence in Gaza, saying the Palestinian territory was in a “critical condition”. Ban Ki-moon, who spoke in New York after returning from a visit to the region, was critical of both sides for firing into civilian areas. He said Hamas had fired missiles into civilian areas of Israel, while Israeli forces had used high-explosive weapons in the crowded Gaza Strip. The secretary general repeated the UN’s call for an immediate, unconditional humanitarian ceasefire in Gaza during the Muslim Eid al-Fitr holiday. Later, the French presidency said the leaders of the US, France, Germany, Italy and Britain – who held telephone talks – had “agreed to redouble their efforts to obtain a ceasefire. Pressure must increase to get there”. At least 10 people – eight of them children – were killed in Monday afternoon’s blasts in Gaza City, Palestinian health officials said. 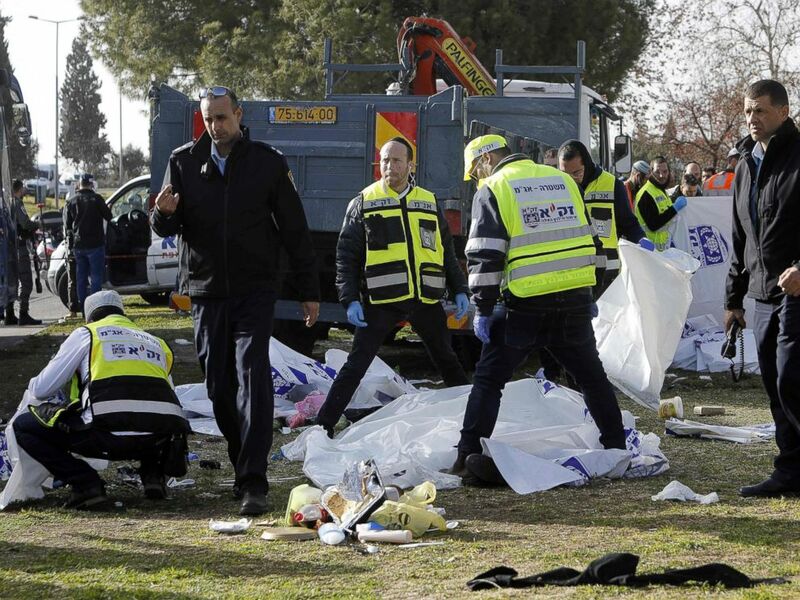 Palestinian officials say the 10 were killed by Israeli missile strikes, but Israel says the explosions were caused by rockets misfired by “terrorists”. Four Israeli soldiers were killed and another 10 injured when a mortar shell hit the Eshkol district. The Israeli military said the five Hamas militants who died had entered Israel via a tunnel from Gaza and opened fire on Israeli troops, who returned fire. The body of a Palestinian teenager, who was kidnapped overnight in East Jerusalem, has been found in a forest in Givat Shaul. A boy was seen being forced into a car in Shufat early on Wednesday. Within hours, a partly-burned corpse was discovered in the forest. Israeli police were unable to confirm the motive, but Palestinian sources said it appeared to be a revenge attack for the murder of three Israeli teens. Later, Palestinians clashed with Israeli police near the boy’s home. The protesters threw stones at the officers, who reportedly responded by firing sound bombs, tear gas and rubber bullets. The mayor of Jerusalem, Nir Barkat, called for restraint. “This is a horrible and barbaric act which I strongly condemn,” he said in a statement. Initial reports said the boy was abducted in the early hours of the morning near his father’s shop in the Arab district of Shufat in East Jerusalem. Witnesses say he was bundled into a white car. A few hours later his body, partly burned and bearing marks of violence, was found abandoned in a forest in the western outskirts of the city, the report said. Israeli police spokesman Micky Rosenfeld said they were looking to see if there was a connection between the missing teenager and the body that was found. Officers were looking into possible criminal or nationalistic motives for the killing, he added. A senior official from the Fatah movement of Palestinian Authority President Mahmoud Abbas told the Reuters news agency that his family had identified the body. “The Israeli government bears responsibility for Jewish terrorism and for the kidnapping and murder in occupied Jerusalem,” said the official, Dmitry Diliani. The killing comes a day after funerals were held in the West Bank for the three Jewish seminary students whose bodies were found near the city of Hebron on Monday, two-and-a-half weeks after they were abducted. Thousands of people attended the ceremony in Modein, among them Israeli PM Benjamin Netanyahu and President Shimon Peres. 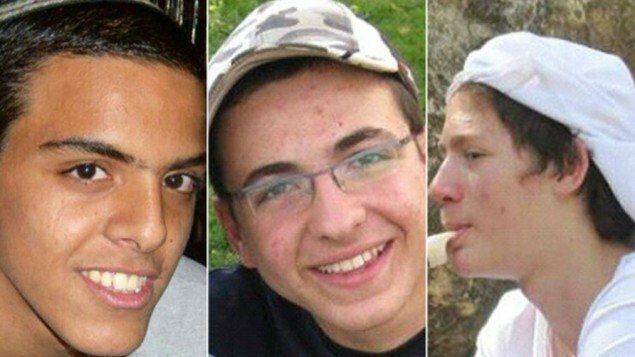 Israel is holding the funerals of three teenagers who were abducted and murdered while hitch-hiking in the occupied West Bank. Israeli has blamed the Palestinian militant group Hamas for the deaths. Hamas has denied any involvement. The teenagers’ bodies were found on Monday evening more than two weeks after the youths went missing. 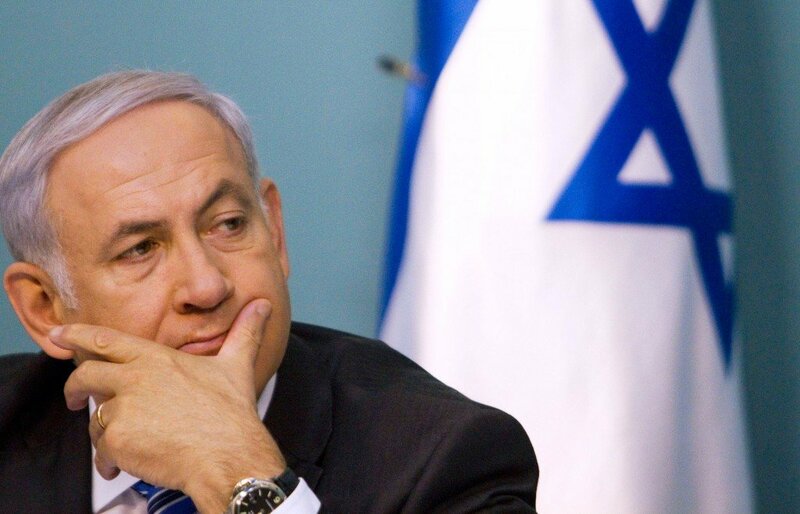 Israel’s PM Benjamin Netanyahu has said Hamas will be made to “pay” a price for the killings. Overnight, Israel launched more than 30 air strikes on facilities linked to militant groups in the Gaza Strip after 18 rockets were fired into Israel since Sunday night, the Israeli military said. 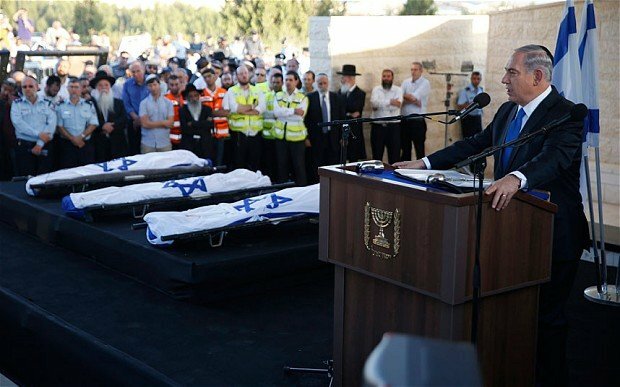 Benjamin Netanyahu, who will attend the joint funeral held for Naftali Frenkel, Gilad Shaar and Eyal Yifrach, said the teenagers had been “kidnapped and murdered in cold blood by animal”. The funeral will take place from 17:30 local time at Modiin cemetery in central Israel. Modiin, which is between Tel Aviv and Jerusalem, is close to the boys’ family homes. The teenagers’ bodies were found under a pile of rocks near the Palestinian town of Halhul. An Israeli official said it appeared the youths had been shot soon after their abduction. Israeli troops flooded into Halhul after the discovery. Its Shin Bet security agency had named two Hamas members from Hebron – Ayoub al-Kawasma and Abu Aisheh – as suspects. The Israeli military raided the homes of both men, setting off explosives. Palestinian witnesses said Abu Aisheh’s home was destroyed. The disappearance of the teenagers on June 12 sparked a huge search operation in Palestinian towns and cities across the West Bank. More than 400 Palestinians were arrested, while five were killed in fighting with Israeli troops. Benjamin Netanyahu has said the incident is a consequence of “the partnership” between Hamas, which rejects Israel’s right to exist, and the Fatah movement of Mahmoud Abbas. Mahmoud Abbas and Benjamin Netanyahu signed a reconciliation deal in April after years of division and formed a unity government last month. Former Egyptian President Mohamed Morsi is being held over allegations of links with Palestinian militants Hamas and plotting attacks on jails in the 2011 uprising, it has been announced. The ousted president is to be questioned for an initial 15-day period, a judiciary order said. 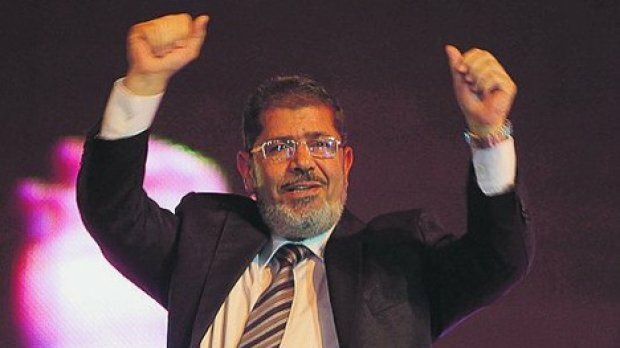 Mohamed Morsi has been held at an undisclosed location since his removal by the military on July 3. The announcement comes as supporters and opponents of the deposed president prepare to stage mass rallies in Cairo. The order issued on Friday is the first official statement on Mohamed Morsi’s judicial status since he was overthrown. It says the former president is suspected of conspiring with Hamas, which rules the Gaza Strip and has strong links with Mohamed Morsi’s Muslim Brotherhood, during the uprising against former President Hosni Mubarak. The state-run Mena news agency says Mohamed Morsi is accused of colluding with the Palestinian group to storm police stations and jails, “setting fire to one prison and enabling inmates to flee, including himself, as well as premeditated killing of officers, soldiers and prisoners”. Mohamed Morsi and several Muslim Brotherhood leaders were freed during a breakout at a Cairo prison in January 2011. A spokesman for the Muslim Brotherhood, Gehad el-Haddad, described the accusations as “ridiculous”. He told Reuters news agency that the order marked the return of the “old regime”. The army has warned any attempt to use violence during mass rallies planned on Friday will be “dealt with decisively and with force”. On Wednesday, army chief General Abdel Fattah al-Sisi called on people to take to the streets to give the military a mandate to confront violence and “terrorism”. Since Mohamed Morsi was ousted, dozens of people have died in clashes between supporters and opponents of the Islamist leader. Militants have also staged deadly attacks in the Sinai peninsula. The Tamarod movement that organized protests which preceded Mohamed Morsi’s removal has urged its supporters to take part in Friday’s rallies. “We call on all of the great Egyptian people to gather in the squares on Friday to officially demand that Mohamed Morsi be put on trial and to support the Egyptian armed forces in its coming war on terrorism,” it said. Some analysts say the military could be preparing to move against sit-ins by Morsi supporters, including one in front of the Rabaa al-Adawiya mosque in a Cairo suburb. Mohamed Morsi narrowly won the presidential election in June 2012 to become Egypt’s first democratically elected president, but his opponents accused him of trying to impose an Islamist agenda on the country. Interim President Adly Mansour has set out a “roadmap” towards a revision of the constitution introduced by Mohamed Morsi and for fresh elections in early 2014, but this has been rejected by the Muslim Brotherhood. There has been no official response to Hisham Qandil’s suggestions, and military spokesmen have previously given the Muslim Brotherhood a deadline of Saturday to join the official process. An Israeli strike on a home in Gaza has killed at least 10 people, officials say, as Sunday became the deadliest day since Israel launched an operation against Hamas militants this week. The strike targeted a Hamas official and that a number of children were killed. PM Benjamin Netanyahu says Israel is ready to expand its operation. Gaza militants continue to fire rockets at Israel, with injuries reported in towns including Ashkelon and Ofakim. Sources on both sides say attempts to reach a ceasefire are continuing. At least 21 people are reported to have been killed in Gaza by Israeli bombardments so far on Sunday. Of the total, at least nine were children and at least four were women, Gaza health officials said. This brings the death toll in Gaza since Israel launched its Operation Pillar of Defence on Wednesday to 67, the officials said. Three Israelis were killed on Thursday. Diggers were trying to scoop rubble from flattened buildings and with rescuers frantically trying to find survivors. The man targeted was Mohamed Dalou. Hamas said eight members of his family also died, including a number of children, along with two other people. The casualties were taken to Shifa hospital, where earlier our correspondent had seen injured children brought in, one covered in blood. The hospital went from organized calm to frantic chaos as doctors tried to dress wounds. One nurse broke down in a corner and colleagues tried to comfort her. Seven homes belonging to Hamas officials have been targeted by Israeli strikes on Sunday. The Israel Defense Forces (IDF) said that 76 missiles fired from Gaza had hit Israel on Sunday, while 37 were intercepted by its Iron Dome missile defence system, including at least one over Tel Aviv. The Israeli ambulance service reported two people were seriously injured, with 10 moderately or lightly hurt. Israel’s state radio reported that a volley of 10 rockets had been fired at Ashdod, with three falling in a residential area and seven people treated for shock. One rocket from Gaza made a direct hit on a residential building in Ashkelon, causing injuries and damage. Another rocket hit a car in Ofakim, causing injuries, the IDF said. 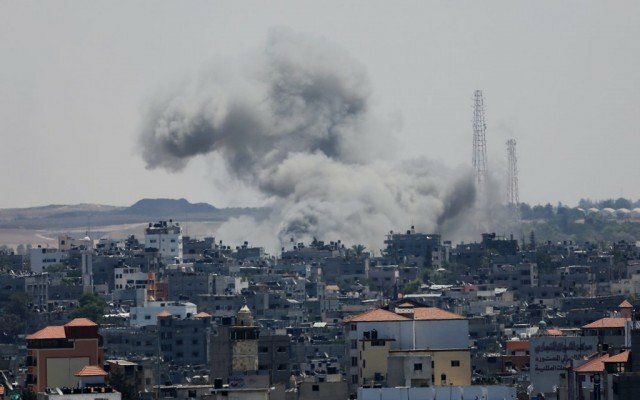 Israel’s attacks on Gaza had been stepped up again at about 02:00 a.m.
Israeli media reported that the head of Hamas’s rocket-launching unit, Yehiya Bia, had been killed in a strike. Two media buildings were struck in Gaza City, injuring eight Palestinian journalists, one of whom had to have a leg amputated. Among those using the buildings were a Hamas television channel, al-Quds TV, as well as Sky News and ITN. The World Health Organization says hospitals in Gaza are now overwhelmed with casualties and short on supplies. Palestinian officials say a number of people are still missing under rubble and the total of injured since Wednesday is now 560. Steps are continuing to try to reach a ceasefire. Egyptian security officials said a senior Israeli official had arrived in Cairo for talks but Israel has made no comment. President Barack Obama, speaking on Sunday, said Washington was “fully supportive of Israel’s right to defend itself”. Benjamin Netanyahu said at a cabinet meeting on Sunday that Israeli soldiers were ready “for any activity that could take place”. “We are exacting a heavy price from Hamas and the terrorist organizations and the Israel Defense Forces are prepared for a significant expansion of the operation,” he said. Egyptian President Mohammed Mursi has said an Israeli ground invasion will have “serious repercussions”, saying Egypt would never accept it “and neither will the free world”. The Arab League, which met in emergency session in Cairo, is sending a delegation of foreign ministers to Gaza on Tuesday. Before the recent offensive, Israel had repeatedly carried out air strikes on Gaza as Palestinian militants fired rockets across the border. But the aerial and naval bombardment is its most intense assault on the coastal territory since Israel launched a full-scale invasion four years ago. The Israeli military and militants in Gaza are continuing to trade fire, with the round of violence that has followed Israel’s killing of Hamas’s military chief showing no sign of abating. Israel hit 200 sites overnight, including PM Ismail Haniya’s office. Gaza militants fired dozens of rockets into Israel, including one at the city of Tel Aviv that was intercepted. Meanwhile, Hamas leader Khaled Meshaal will hold talks with leaders of Egypt, Qatar and Turkey on Saturday. The talks will take place in Cairo, which has also been hosting an emergency meeting of the Arab League. The League agreed to send a delegation to the Gaza Strip. Reuters quoted Secretary General Nabil el-Araby, who will lead the delegation, as saying this would take place in the next “one or two days”. At least 40 Palestinians and three Israelis have now died since Israel killed the Hamas military chief Ahmed Jabari on Wednesday. Israel’s military says it still has hundreds of targets it wants to hit in the Gaza Strip. A spokeswoman also said that troops gathered near the border were ready to invade should the Israeli government give the order. The Israeli military spokeswoman said it did not see any distinction between the military and political wings of Hamas and that anything connected with the militant group was considered a legitimate target. An Israeli air force spokesman said it had destroyed at least 90% of long-range rockets in Gaza and severely damaged medium- and short-range rockets, and the infrastructure to fire them. However, hundreds of short-range missiles remained, he said. Despite the ferocity of the Israeli bombardment, some 60 rockets were reported to have been fired into Israel on Saturday, with some buildings damaged and four soldiers suffering minor injuries. Sirens went off around Tel Aviv on Saturday, with Israel’s military saying that a missile had been intercepted by a newly installed battery of its Iron Dome defence system. One rocket also hit an apartment building in the Israeli port city of Ashdod, wounding several. Israel has now put 75,000 reservists on stand-by, on top of the 16,000 called up in recent days. So far, there has been no decision on sending in the troops. However, one government minister has been quoted as saying that soldiers could launch a ground offensive into Gaza within the next 24 hours if the rocket fire does not stop. The Israel Defense Forces released figures on Saturday stating that, over the past three days, 492 rockets fired from Gaza had hit Israel, while another 245 had been intercepted by Iron Dome. 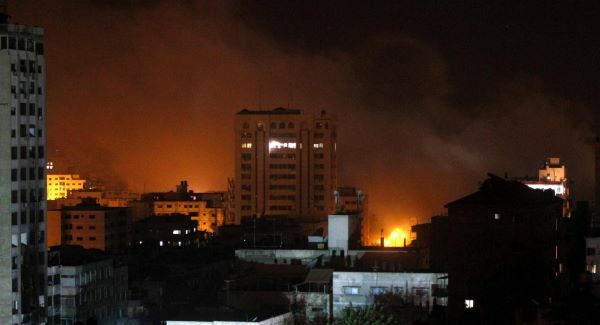 On Saturday, Gaza City was hit by a string of large explosions shortly after 03:00. There was another series of strikes in and around the city after 05:00, with several targeting Hamas’s cabinet buildings, which correspondents say were likely to have been empty. Another of the targets was the house of a Hamas leader in Jabaliya, north of Gaza City. Israel said it was targeting rocket launchers, weapons storage facilities and smuggling tunnels on the border with Egypt in southern Gaza. Israeli military spokeswoman Avital Leibovich said 200 targets had been hit overnight. Government spokesman Mark Regev said the operation would end when Israeli citizens were safe, and that all options – including a ground incursion – remained “on the table”. Militants and civilians, including at least seven children, have been among the Palestinians killed during Israeli strikes in recent days, Hamas says. 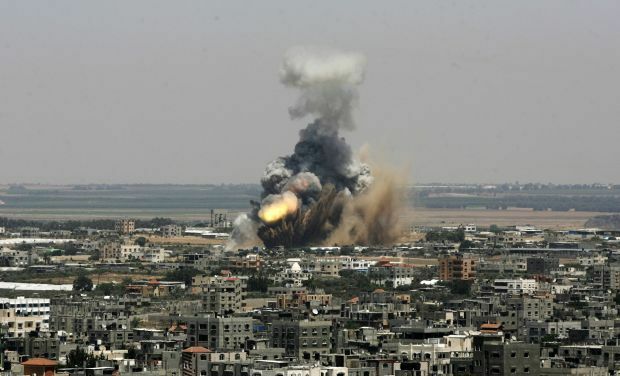 Before the recent offensive – codenamed Pillar of Defence – Israel had repeatedly carried out air strikes on Gaza, as Palestinian militants fired rockets across the border. Most of them landed in the south, but a small number have been aimed at Tel Aviv and Jerusalem. The three Israelis who died were in a building in the southern town of Kiryat Malachi which was hit by a rocket on Thursday. A quarter of the attacks have been intercepted by the Iron Dome system, officials say. Hamas has confirmed Khaled Meshaal will meet the Emir of Qatar, Egypt’s President Mohammed Mursi and Turkey’s President Recep Tayyip Erdogan in Cairo on Saturday night to discuss how a ceasefire can be achieved. A senior Hamas source in Gaza said proposal for a truce made by Turkey was being studied by the Hamas delegation in the Egyptian capital. Ahead of the meeting, Recep Tayyip Erdogan said: “It’s a tactic of Israel’s to point the finger at Hamas and attack Gaza. Palestinian Authority President Mahmoud Abbas has accused Israel of carrying out “massacres”. Tunisian Foreign Minister Rafik Abdessalem arrived in Gaza through the Rafah border crossing from Egypt to show support for Hamas. Later on Saturday he visited the wreckage of Ismail Haniya’s HQ. Qatari Emir Sheikh Hamad bin Khalifa Al Thani has arrived in the Gaza Strip – the first head of state to visit since the Islamist group Hamas came to power there in 2007. Sheikh Hamad bin Khalifa Al Thani is expected to launch a $254 million construction project to help rebuild the war-torn Palestinian territory. Qatar has become one of Hamas’s main benefactors since it fell out with Syria and has had a rift with Iran. The Palestinian Authority expressed reservations about the emir’s visit. Sheikh Hamad flew to Egypt and crossed into Gaza by car amid tight security. The Hamas interior ministry said it had a “well-prepared plan” to protect the emir, deploying thousands of security personnel and blocking roads to Gaza City’s stadium, where he is expected to address a crowd. Earlier, the Israeli military said a soldier had been wounded by a bomb explosion along Israel’s border fence with Gaza, near Kissufim. The visit is a sign of the increasing ties between the Gulf state and Hamas. Qatar, one of the richest countries in the Arab world, has become an important source of revenue for Hamas in the aftermath of its fallout with Syrian President Bashar al-Assad. 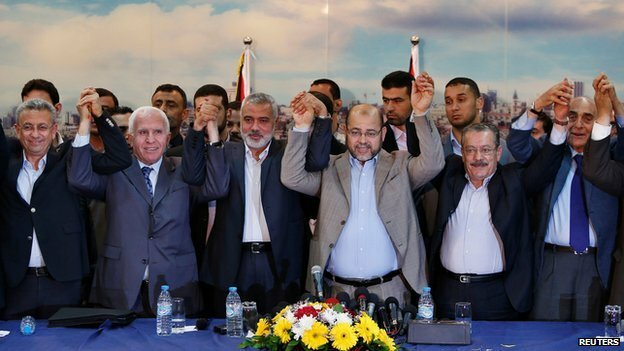 In February, Hamas announced that its political leadership had been moved from Syria to Egypt and Qatar, because it could no longer effectively operate because of the unrest in its long-time ally. 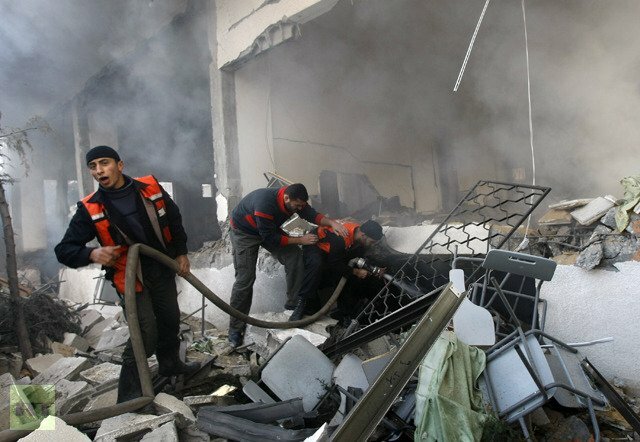 The political bureau of Hamas had been based in Damascus since 1999, and relations appeared to be good until anti-government protests erupted throughout Syria in March 2011. Hamas initially neither publicly endorsed the Syrian government’s handling of the uprising nor repudiated it. Analysts said the Sunni Islamist movement was torn between risking the financial backing of Syria and its ally, Iran, and supporting Syria’s majority Sunni community, which has borne the brunt of the crackdown by the Alawite-dominated security forces. But in February, the head of the Hamas government in Gaza, Ismail Haniya, declared his support for “the heroic people of Syria who are striving for freedom, democracy and reform”. Qatar, meanwhile, was the first Arab nation to call publicly for military intervention in Syria to topple the government. It was the main Arab player in the NATO-led coalition in Libya and has played a major part in trying to resolve regional conflicts. The country maintains cordial relations with both the US and Iran, and – even more unusually for an Arab state – with both Hamas and Israel. Most recently, Qatar has been involved in the reconciliation process between Hamas and its long-time rival faction, Fatah, which dominates the Palestinian Authority and is in power in the West Bank. Hamas, which won parliamentary elections in 2006, ousted forces loyal to Palestinian Authority President Mahmoud Abbas in Gaza during clashes in 2007 and set up a rival government. In response, Israel tightened its blockade on the coastal territory, which has had a crippling effect on Gaza’s economy. A spokesperson for Mahmoud Abbas said the Palestinian Authority welcomed Qatar’s efforts to help the people in Gaza but also stressed “the necessity to preserve the legitimate representation of the Palestinian people”. Mahmoud Abbas called on Sheikh Hamad to “urge Hamas in Gaza to go for reconciliation and to end this split”. Egypt’s Bedouin tribal leaders in Sinai peninsula have agreed to help restore security in the lawless border area with the Gaza Strip and Israel. In talks with Interior Minister Ahmed Gamal al-Din, they also backed plans to destroy smuggling tunnels into Gaza. The move comes as Egyptian troops mass in the area in an operation to contain Islamist militants who have built up a presence in the area. The militants are suspected of killing 16 Egyptian border guards on Sunday. Egypt has deployed extra troops, tanks and other armored vehicles. Ahmed Gamal al-Din met the tribal leaders late on Thursday night at al-Arish, about 50 km (30 miles) west of the Gaza border, to ask for their support. Sheikh Atef Zayed, a member of Al-Rishad tribe, said all present had pledged to support the military’s operation. “Egypt’s security is a part of Sinai’s security,” Reuters news agency quoted him as saying. Another tribal leader, Eid Abu Marzuka, said the tribes had also reached a consensus that the tunnels should be destroyed. “Let Hamas be upset, we don’t care,” he said, of the Islamist group which control the Gaza Strip. Eid Abu Marzuka said Israel’s contact with Palestinians in Gaza should be through the official Rafah border crossing. There are more than 1,200 illegal tunnels along the Egypt-Gaza border. 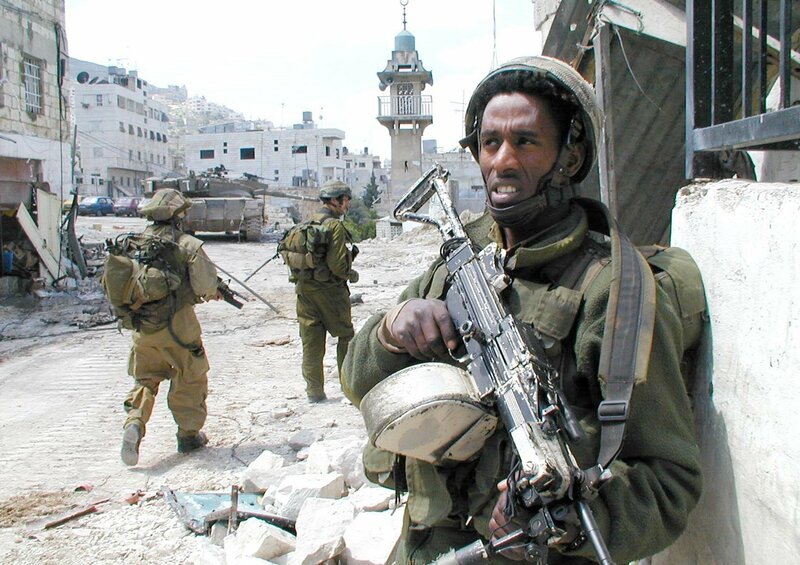 They are used to get basic goods past Israel’s blockade of the enclave but also smuggle in weapons and people. The militants who launched Sunday’s attacks are believed to have used them as an escape route. Egypt’s Mena news agency reports that the army has already begun sealing them off. The latest violence in the Sinai region began on Sunday, when militants carried out the deadliest and most brazen attack against Egyptian troops in the Sinai region for decades, killing 16 border guards. 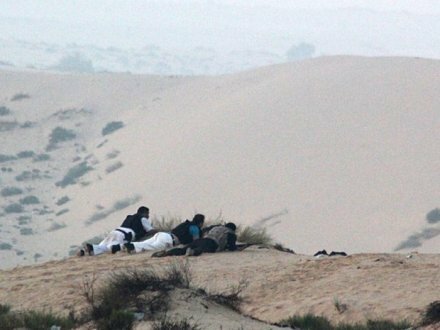 There were further attacks on checkpoints in al-Arish on Wednesday, which left a number of people wounded. Egypt launched its military offensive hours later, carrying out missile strikes from helicopters. According to military officials, 20 people were killed in the village of Touma, while the Sheikh Zuwaid area to the west was also hit. Further armoured personnel carriers could be seen overnight on Thursday, heading eastwards towards the border region. Egypt’s military presence in Sinai is limited and requires Israeli approval under the terms of the 1979 peace treaty which returned Sinai to Egyptian control. Analysts say that the security situation in the area has deteriorated following the fall of Hosni Mubarak last year, and that Islamist extremists appear to have gained a foothold. Gilad Shalit released today in a thousand-for-one exchange deal. Gilad Shalit, the Israeli soldier who was Hamas prisoner for five years in Gaza, has been released today. Sergeant Gilad Shalit was freed as part of an exchange between Israel and Hamas. In return, Israel will release 477 Palestinian prisoners as part of the deal. The Israeli soldier was taken across the frontier from the Gaza Strip into Egypt’s Sinai peninsula, where he was handed over to Egyptian officials. Gilad Shalit will be taken to Israel’s Vineyard of Peace border crossing a short distance away down a desert road. Early in the morning, convoys of white vans and trucks transported hundreds of Palestinian prisoners to the locations in the West Bank and on the Israel-Egypt border where they were to be freed. Some of the Palestinian prisoners were due to be taken to the Sinai and handed over to Egyptian officials for transfer to the Gaza Strip, which is run by Hamas. Other prisoners were to be released in the occupied West Bank. Among the Palestinian prisoners released some were serving life sentences for carrying out deadly attacks. It is expected in about two months, another 550 Palestinians are to be released in a second stage of the Egyptian-brokered agreement. The Israeli and Hamas exchange involves a delicate series of staged releases, each one triggering the next. Gilad Shalit has been popularly portrayed in his country as “everyone’s son” and opinion polls showed that an overwhelming majority of Israeli backed the thousand-for-one deal. Sergeant Gilad Shalit appeared to be healthy in the only time he has been seen in captivity – in a brief and scripted 2009 video released by Hamas – he was denied all visits, including by the Red Cross, and the state of his mental and physical health is unclear. The exchange deal received approval from Israel’s Supreme Court last Monday after it rejected petitions from the public to prevent the mass release of prisoners, many of them serving life sentences for deadly attacks. 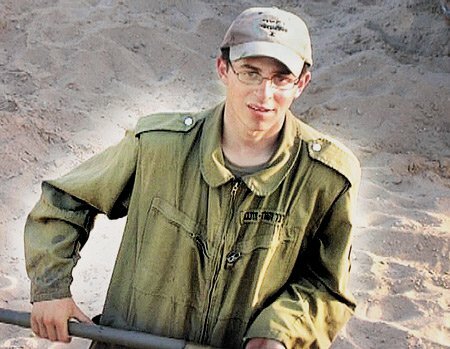 In June 2006, Gilad Shalit was abducted by Hamas militants who tunneled into Israel from the Gaza Strip and surprised his tank crew, killing two of his comrades. After Gilad Shalit was seized, Israel, which withdrew troops and settlers from Gaza in 2005, tightened its blockade of the coastal territory. The Israeli deal with Hamas (a group classified by the United States and European Union as a terrorist organization because of its refusal to recognize Israel and renounce violence) is not expected to have a direct impact on efforts to revive Middle East peace talks. 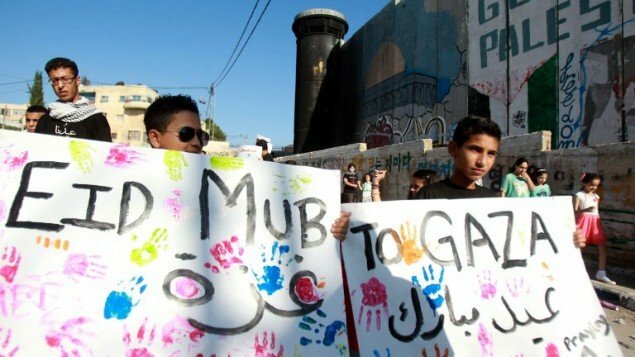 Palestinian President Mahmoud Abbas, a Hamas rival, has been pursuing United Nations recognition of Palestinian statehood in the absence of negotiations with Israel that collapsed 13 months ago in a dispute over settlement-building in the occupied West Bank. In the morning, crowds were gathered in both Gaza and the West Bank awaiting the return of their prisoners. Gilad Shalit will be flown by helicopter to an air base in the centre of Israel, where soldier will be greeted by Prime Minister Benjamin Netanyahu and reunited with his family. Then Gilad Shalit will fly to his home in northern Israel. There were some concerns in Israel about the repatriation of captured soldiers and that the country is paying a high price for the release of Gilad Shalit. 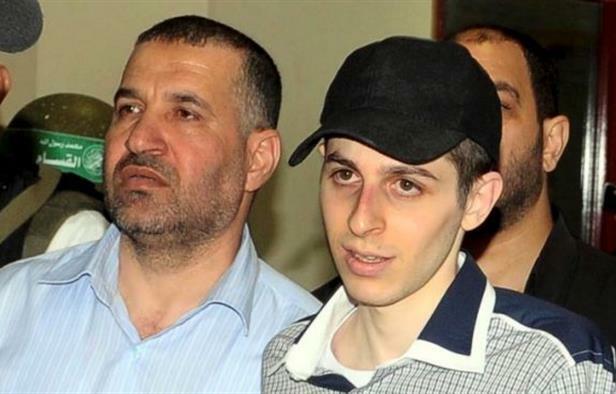 Gilad Shalit released, as Israel and Hamas agreed on a prisoners swap deal. Israel and Hamas group, which runs in Gaza, have agreed on a deal for releasing Sergeant Gilad Shalit, an Israeli soldier held hostage by Palestinian militants since 2006. Israeli PM Benjamin Netanyahu said they agreed only after arduous talks, and that Sergeant Gilad Shalit, 25, would be back with his family “within days”. In exchange, Israel said will release hundreds of Palestinian prisoners. Gilad Shalit was captured in a cross-border raid five years ago, and attempts to negotiate his release have failed. Gilad Shalit’s continued detention is a hugely emotive issue in Israel, where his family has maintained a high profile campaign for his release. In the same time, there are many Israelis who have had family members killed by Palestinian militants and, of course, will object in principle to any mass release of prisoners by Israel. According to a senior Israeli official, there are some high-profile Palestinian prisoners that have been excluded from the release deal. The Israel and Hamas deal was confirmed in the Israeli cabinet by a 26-3 vote, following a heated three-hour debate. “This is a difficult decision, but leadership is tested at moments like this, on the ability to make difficult decisions,” said PM Benjamin Netanyahu in a statement. On the other hand, Hamas said in a statement that there were tens of thousands of people on the streets celebrating the deal, firing guns into the air and honking car horns. Hamas’s leader Khaled Meshaal, who is in exile in Syria, appeared on TV to hail the swap deal as a victory for the Palestinian people. Khaled Meshaal said the Israel had agreed to release 1,027 prisoners – including 27 women. According to Yoram Cohen, head of Israel’s Shin Bet internal intelligence service, the high-profile prisoners not due for release include key Fatah leader Marwan Barghouti, Ahmed Saadat, found guilty of ordering the killing of Israel’s tourism minister in 2001, and Hamas’ Abdullah Barghouti. The first 450 prisoners would be freed in the coming days, with the rest being released over the next two months. “It is a great achievement, a qualitative success,” said the militant group’s leader, Khaled Meshaal. Hamas leader promised to carry on working to free every Palestinian prisoner held in Israeli jails. About 5,000 Palestinians are now held by Israel – some of whom have been convicted of serious crimes, but others are being held without charge. Local Israeli television, Channel 2 TV reported that both sides, Israel and Hamas, had shown greater flexibility in recent talks. Indirect talks over the Gilad Shalit ‘s release have been going on for years, with Egypt and Germany mediating. 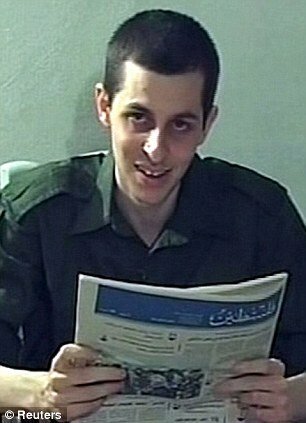 In October 2009, Hamas released a video of Gilad Shalit calling on Benjamin Netanyahu to do everything to free him.